IRVINE, CA--(Marketwired - Apr 10, 2014) - The beauty of experience. It is what defines Brookfield Residential's promise of excellence achieved through a legacy of stellar award-winning communities including Strada in Newport Coast, the Strand in Crystal Cove, and Citrus at Turtle Ridge. It is also what has inspired the next landmark community to come from this influential homebuilder and land developer. Introducing La Vita at the Groves in Orchard Hills™, a grand new-home offering in the vein of Brookfield Residential's best places to call home being unveiled late spring. 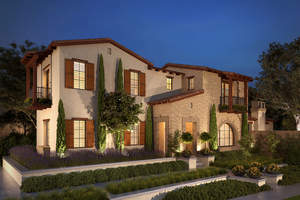 For more information on the much-awaited debut of La Vita at Orchard Hills and to receive insider updates, homebuyers are invited to visit www.BrookfieldSoCal.com. At La Vita, a love of architectural refinement and a hilltop location that captures the romance of a European countryside forges the dream of enchanted living that is coveted by many and attainable by only a few. La Vita by Brookfield Residential is poised to redefine the standard for luxury in Irvine with a special new enclave in a secluded setting like no other, among exquisite surroundings in Orange County near working avocado groves. The gated privacy of the Groves at Orchard Hills sets an incomparable tone, matched by La Vita's Italian-inspired architecture that showcases the very best of Brookfield's signature style. La Vita is quite simply more than a new-home neighborhood. It is the rare enclave that is capable of transporting those who discover it to another place. "La Vita was inspired by the essence of an extraordinary location in Irvine, with a worthy nod to European villages, to create the true California dream," said Mercedes Meserve, Senior Marketing Director for Brookfield Residential Southern California. "Highly detailed elevations will bring an authentic Tuscan flavor to the exterior of the homes, with stone, wrought iron and wood elements juxtaposed against the majesty of nature. La Vita's residences will also enjoy traditional piazza configurations with private driveways, further exploring the distinctive European experience. The combination is as dramatic as you would expect from a location this magnificent among surroundings this majestic." This remarkable new collection is already captivating homebuyers who seek the finest new residences to grace Irvine in many years. Highly detailed interiors with amenities that speak to both a sense of grandeur and an ease of living will be showcased in four spectacular single-family detached homes that range from approximately 3,400 to 4,000 square feet of two-story living space. The homes will feature 4 to 5 bedroom suites and 4.5 to 5.5 baths, with a first-floor master suite and/or generous guest suites in all four plans. Further highlighting La Vita's impressive design and livability, each of the sumptuous master suites will boast spa-inspired baths with luxurious tubs and large walk-in closets, and the secondary bedrooms will each include their own private baths. La Vita's kitchens will showcase impressive features for even the most studied gourmet chef, with expansive kitchen islands and adjoining prep/high heat wok kitchens with a walk-in pantry, sink, and second dishwasher, offering an ideal space for those who love to entertain but who would prefer to keep their main kitchen pristine and keep the prep work out of sight. This space can also be customized to the needs of the home's owner, and turned into an optional craft room. The ideal of indoor-outdoor living will be fully realized at La Vita, with bi-fold or multi-slide doors that allow a seamless flow between living spaces and outdoor rooms. Serene relaxation, al fresco dining, and grand entertaining are all part of the La Vita experience. Orange County. A place of such dramatic topography and natural beauty, it is distinguished as a true landmark within the Villages of Irvine®. Set amidst rare natural beauty, 12 new home neighborhoods offer an impressive range of architectural designs within this extraordinary Irvine address. Rolling hillsides, acres of open space and proximity to working avocado groves highlight the village's rare natural splendor and serenity. Brand new luxury neighborhoods epitomize sophistication and architectural differentiation. Created by Irvine Company Community Development, Orchard Hills is conveniently located in Irvine, California. The City of Irvine was recently ranked by Money Magazine as the "6thLive in America." The highly-acclaimed master-planned community is renowned for allowing residents to enjoy a unique lifestyle unmatched in the region -- some of the best schools in the state; America's safest city for nine straight years; abundant open space, parks and recreational opportunities; and world-class dining, entertainment and employment. For more information about the Villages of Irvine, visit www.VillagesofIrvine.com. La Vita by Brookfield Residential is poised to redefine the standard of luxury living in Irvine.